Hamas took advantage of the chaos created by last year’s Gaza conflict with Israel to settle political scores through summary executions and torture, an Amnesty UK report alleges. The Islamic political organization, which governs the Gaza Strip, was accused of committing abuses tantamount to war crimes. Amnesty alleges Hamas publicly executed six men outside a mosque last August because they were suspected “collaborators” with Israel. Members of the rival political organization Fatah were also targeted, with some being abducted, tortured and attacked by Hamas forces. Amnesty’s 44-page report titled ‘Strangling Necks’ investigates human rights abuses perpetrated by Hamas during the Gaza-Israel conflict of 2014. 1/2 So per Amnesty reports. Both Israel and Hamas are war criminals. So is it all square now and we just pity Palestinians? Me thinks not. Israel’s onslaught against Gaza last summer, dubbed Operation Protective Edge, claimed the lives of over 2,000 Palestinians and 72 Israelis. The United Nations (UN) estimates more than 7,000 homes for 10,000 entire families were destroyed as a result of Israeli fire, while 89,000 homes were damaged. It is estimated reconstruction will take over 20 years at a cost of $4-6 billion. 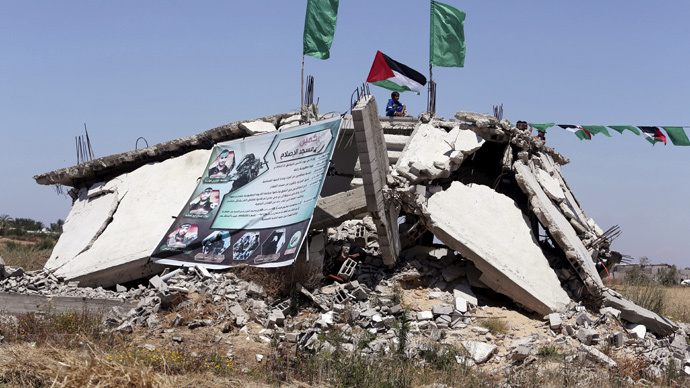 While Amnesty acknowledged Israel inflicted “massive death and destruction” on Gaza during the conflict, the report focuses on Hamas’ crimes committed on its own population. In one incident, six men were publicly executed outside the al-Omari mosque in front of a crowd of spectators which included children on August 22. The report contains a detailed account of the killings, which describes the hooded men being dragged along the floor to kneel by a wall facing the crowd before being shot with AK-47s. A former police officer with a mental disability was also executed, according to Amnesty. Atta Najjar was serving a 15-year prison term for “collaborating” with Israel when he was taken out of prison and killed on August 22. “He had slaughter marks around his neck, marks of knives … He was heavy, like when you put meat in a bag; no bones. His bones were smashed,” he added. Amnesty also alleges Hamas settled scores with rival political organization Fatah during the upheaval caused by the conflict. Their report claims Hamas forces abducted, tortured and attacked members of the political group. “It is absolutely appalling that, while Israeli forces were inflicting massive death and destruction upon the people in Gaza, Hamas forces took the opportunity to ruthlessly settle scores, carrying out a series of unlawful killings and other grave abuses,” Amnesty International Middle East and North Africa Director Philip Luther said. Amnesty has called on the Palestinian authorities, including Hamas, to co-operate with an independent international investigation of the allegations.